… great things happen. Staff and customers are well informed, visitors are greeted, children are entertained and important medical information reaches its target audience. 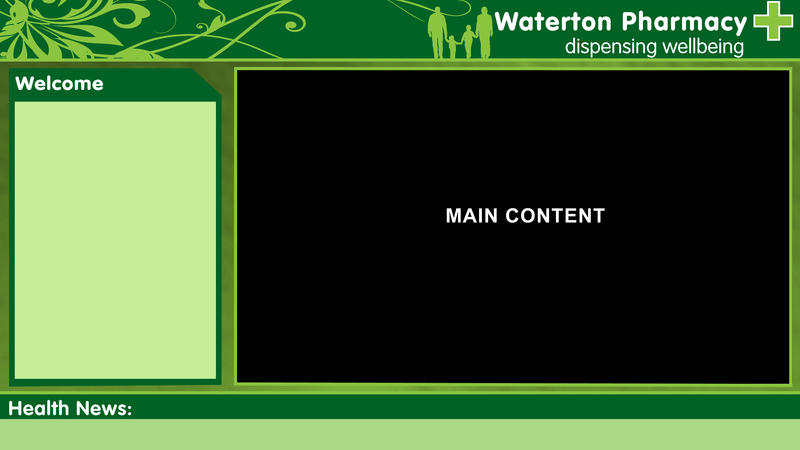 Each of the screens is connected to a digital signage player containing our digital signage software. The players are linked to the client’s dedicated network and a centralized. 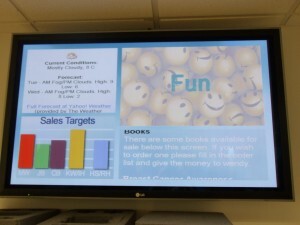 It is used to create, schedule and manage the digital signage solution and all the screens. As part of the complete solution, Dynamax and AuDeo worked together for providing the client with training courses and continue to monitor the digital signage system in the event that any problems should occur. If large organisations benefit from digital signage, the system is no less useful for smaller ones. This particular success story in collaboration with AuDeo features a brand new state of the art community pharmacy. The client wanted a visitor and customer communication system to match their ethos of being an exemplar provider of pharmaceutical services. They required a screen in the pharmacy’s main area to show medical information and advice, pharmacy and medical centre messages and seasonal information and another screen in the children’s section to show children’s TV programs. AuDeo did the installation work and selected our software for its ability to support all the types of content they wanted to present. A 19” screen was installed in the children’s area and a 32” display in the pharmacies main area, both controlled by our software. As it proved necessary, AuDeo also assisted with the initial content creation and template design and then trained the users to update and create further content themselves. A higher volume of enquiries about local medical services. Both Dynamax and AuDeo are proud to present these successful digital signage projects that enabled the pharmaceutical organisations adopting them to enhance their communications and customer experience. Sign up now for a 30 day free trial of our new software digitalsignage.NET or visit our corporate website for more information about our enterprise solution- POVng. This entry was posted in Software and tagged digital signage by Dynamax. Bookmark the permalink.